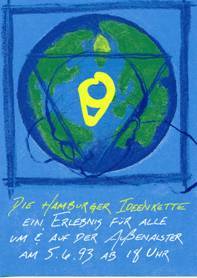 Global Responsibility Festival "Hamburger Ideenkette"
 Please see the "Account of the History of the Conception of the Hamburger Ideenkette Autumn 1992 to February 1993"
The HAMBURGER IDEENKETTE took place on 5th June 1993. The records of its inception, realization and results are documented in a book that is written in German, and the artefacts brought to this event by its participants are now in the Museum für Hamburgische Geschichte. What you read here is part of the preamble, translated into English. At the outset of the HAMBURGER IDEENKETTE stood the personal background of the initiator, Evelin Lindner. Both my parents had to leave their homes in Silesia after World War II. At the end of the war, my father had been sent to the battle fields still being a youth. He lost one arm, after having lost his beloved brothers, and later he also lost the farm he was to inherit, his homeland, and then his father. Born in 1954, my early years were deeply affected by the atmosphere in my family marked by this post-war trauma. During my studies of psychology and medicine, I spent several months abroad each year. I worked in hospitals and related institutions in Israel, Norway, Thailand, USA, China, and New Zealand. I was continuously in search for an answer to the following question: Is there a basic structure in human thinking, common to all cultures, which could lead to better global understanding? Following my studies, I lived for seven years in Egypt and worked as a psychological counsellor and clinical psychologist. This allowed me to gain deep insights into several foreign cultures, including Egyptian and Arab cultures, as well as several Western cultures, since I also had many expatriates from many parts of the world as clients. I was particularly impressed by the skills of the people in the Nile Delta in handling aggression; people typically behaved with a certain degree of tolerance and flexibility towards aggression, however, at the same time were able to confine its excesses. 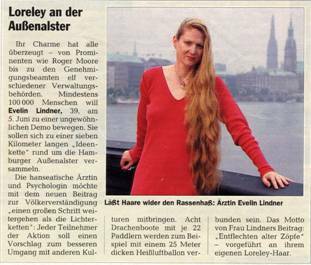 In 1992, I returned to Hamburg and interviewed some 200 local journalists, physicians and artists for my academic research on whether or not the notion of "quality of life" has the same significance in different cultures. Very often, these interviews evolved into the most interesting discussions regarding mutual understanding amongst people in the world, integration, peace and world wide ecological responsibility. These conversations gave the impetus to the development of the concept of the HAMBURGER IDEENKETTE. In 1986, conditions in asylum-seekers' "homes" in Germany had become increasingly inhuman (see, among others, Georg Lohmann. "Menschenrechte- und Menschenwiirdeverletzungen in der Zuwanderungsgesellschaft." In Menschenrechte in der Zuwanderungsgesellschaft, edited by Georg Lohmann and Petra Follmar Otto, pp. 7-20. Universitätsverlag Potsdam, 2. Potsdamer MenschenRechtsTag am 22. November 2012). The outburst of hostilities against foreigners in Germany eventually led to counter-reactions, for instance, the organization of Lichterketten (Chains of Lights), which became a familiar image to all citizens, when thousands of people demonstrated with candles against the discrimination of foreigners. Inspired by this image, and after many rounds of reflections, we developed our concept of a Vision of a World House on the big lake in the middle of the city of Hamburg, called Alster, and the Thread of Human Solidarity stretched around the Outer Alster, which, together were named Hamburger Ideenkette (Chain of Ideas). The Vision of a World House was created to remind all living in a globally interlinked world of the fact that we can not dissociate ourselves from this interdependence. The aim of the Thread of Human Solidarity (a 7 kilometers long red rope fixed on the trees of the park around the lake) was to invite the citizens of Hamburg to attach, like laundry, their ideas, opinions, thoughts, suggestions, letters to politicians, or anything else they wished to express in writing or painting to this thread. Moreover, the site around the Outer Alster was opened up to become the setting for whatever means of expression people would wish to develop, such as dance, song, performance, or theatre. The objective of the book on the HAMBURGER IDEENKETTE (that exists only in German) was to illustrate the repercussions this festival had and to create a means of carrying its concept into the future. Its initiator, Evelin Lindner, wishes the IDEENKETTE to serve as a blueprint for further comparable initiatives and not remain a one time event. At the start, it seemed impossible to convert the idea of a Global Village or World House into an event or happening that would illustrate its interdependence and thus indicate our inescapable responsibility to care for it together. However, slowly, in many consecutive steps the concept crystallized into the shape of a Vision of a World House, a happening in support of global responsibility. 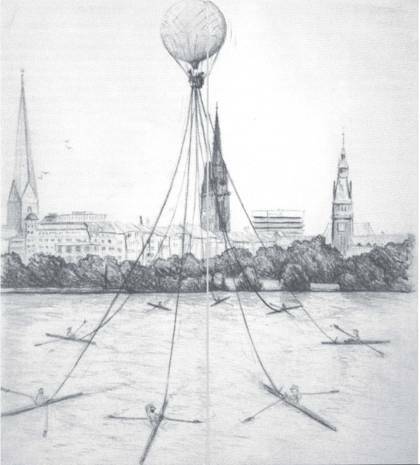 The first idea was to invite a helicopter to hold 166 ropes up into the air (representing the number of nations of the UN as it was at that time), each rope being attached to the roof of a building at the ring road around of inner city of Hamburg, thus forming a new "roof" over the city. This new roof would symbolize the new kind of unity that is also required globally. Clearly, the city of Hamburg could not permit such a performance, due to security reasons. We adapted the idea to being performed by a rowing boat on the Alster. 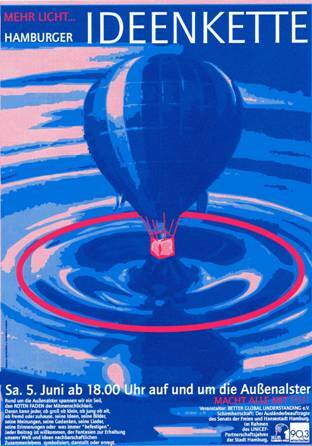 Through many discussions, the project evolved to its final stage: the helicopter was replaced by a hot-air balloon, the number of boats reduced to eight, the ropes would have each a length of 179 meter (the number of members of the UN which in the meantime had increased to 179), moreover each line would bear a string of international flags. The aim was to let the boats, together with the balloon, perform a dance that would visualize global interdependence in an innovative and unprecedented way. 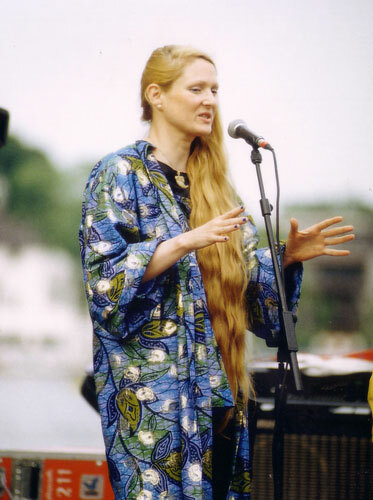 The local radio was to contribute live music and comments so that the audience watching from the shores of the lake could enjoy this both as a visual and acoustic event. We had to find out whether or not our project could be technically realized. After a long search we found a very skilled balloon pilot who judged the project to be feasible. He furthermore was ready to participate. Suitable climatic conditions and timing were essential, he explained: a calm summer day afternoon with a wind speed of less than two knots, together with little uplift, typically to be observed after seven pm on a summer day. For obvious reasons, the happening would have to take place on a Saturday. After consultation with the tourist authorities the date of 5th June 1993 was chosen. The first official contact for the realisation of the Vision of a World House took place on February 2, 1993, with the Referatsleiter of the Authorities for Environmental Affairs for Water- and Soil Protection, responsible for the Alster. 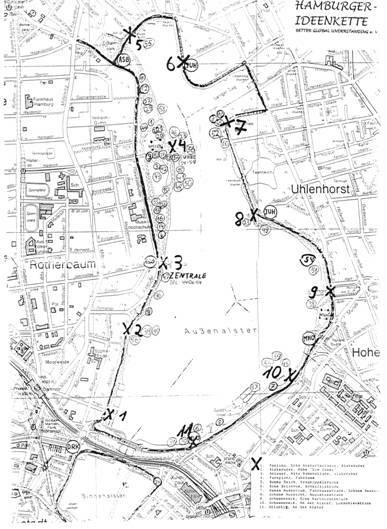 Our first idea to organize the festival on the Inner Alster had to be abandoned. It was not possible to find an unobstructed area of 50 by 50 meters necessary for the inflation and the take-off of a balloon. A suitable place was, however, available on the Alster Green so that the Outer Alster was selected as the site for this event. With the first funding received as support for the event, a professional presentation could be financed. A leaflet with text and graphic design illustrating the Vision of a World House was printed. The Ausländerbeauftragte der Freien Hansestadt Hamburg issued and distributed a letter of recommendation together with a leaflet to several hundred prominent people in a position to propagate the idea. An invitation to the citizens of Hamburg to participate in the event was attached to the letter. February 21, 1993: Founding of the association BETTER GLOBAL UNDERSTANDING e.V. An organizational platform for the planned festival had to be created. The name for the non-governmental non-profit organisaton was chosen to be BETTER GLOBAL UNDERSTANDING. On February 21, 1993, seven founding members met and signed the statutes and the founding convention. The ceaseless eruption of hostilities against foreigners in autumn 1992 had initiated the Lichterketten. Hence, the notion of Lichterketten was well established and known to all citizens. In Hamburg it meant: "One comes to the Alster to demonstrate with a light against hostilities against foreigners." The invitation to the Vision of a World House was an almost identical call: "Come to the Alster with something more than a light, bring your concrete ideas and suggestions as to how to preserve our planet, the global village, or the World House." What could be a better name than Ideenkette for an event in which the idea of the Vision of a World House would take a central part. A reputed designer, together with the referent for public service of the Ausländerbeauftragte, developed the idea that in addition to the Vision of a World House, a rope should be attached to the trees around the Alster, a seven kilometers long red rope to which citizens could attach written or painted contributions, similar to laundry that one attaches on a line. Its name: Red Thread of Human Solidarity. Events were precipitating. It was March 1993. A poster had to be designed, printed, and distributed. Public attention could not be sufficiently attained through writing letters alone. But who was going to produce this poster and who was going to pay for it? The problem was solved within a few days, a foundation agreed to bear the cost for its production, and a reputed photographer/designer was ready to design it. Now the final design for the impressive blue poster was ready. The Hamburger Außenwerbung was willing to display several hundreds of these posters in subway stations and on advertisement billboards. Posters were furthermore distributed through, and displayed by numerous official bodies. Subsequently, postcards were produced and thousands of them distributed. 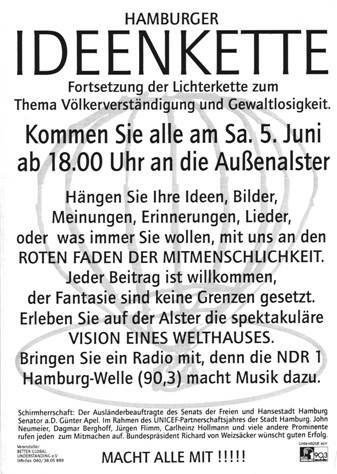 Thousands of flyers were distributed that invited the citizens of Hamburg to participate in the IDEENKETTE. 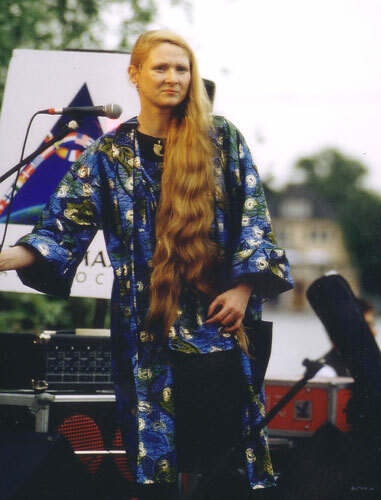 Furthermore, Evelin Lindner invited the citizens of Hamburg to participate in the IDEENKETTE on many radio and TV channels that served the area of Hamburg. Articles in the printed media explained how school children prepared for the IDEENKETTE, or which ideas people planned to present. Lindner was invited to present the project also in national publications, such as Focus. Article in the journal "Focus"
About twenty thousand people came. It was a Saturday afternoon. People came to the park around the Alster with ca. two thousand "ideas" that they had prepared in advance, "ideas" in prose, drawings, or paintings. These objects were attached to a red rope, the Red Thread of Human Solidarity, that the helpers of the association BETTER GLOBAL UNDERSTANDING had fixed on trees around the lake. The participants of this unique festival walked around the lake for many hours, both as actors and audience, reading and viewing the objects. Furthermore, many came who had conceptualized other happenings, such as meditation groups, drawing groups, or mobile musicians bands. People with cultural backgrounds from outside of Germany came with their indigenous clothes and music, and a groups of photographers asked foreigners and German citizens to walk ten steps together and agree to have their pictures exhibited in a subsequent exhibition. Yet another group, which stayed anonymous, had placed crosses with the names of those who had been killed in right-wing violence in Germany after 1945. Evelin Frerk went around and documented the Ideenkette with her pictures. Please click on the picture on the left above or here to see more photos! 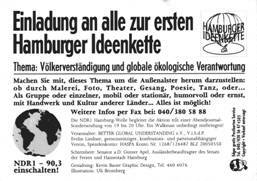 Please see also the "Account of the History of the Conception of the Hamburger Ideenkette Autumn 1992 to February 1993"
In June 1993, a selection of the objects that had been attached to the Red Thread of Human Solidarity were displayed in a first exhibition in Hamburg. In July 1994, these objects were shown to the public in an exhibition in Bonn that was organised by the Ministry of Foreign Affairs. Ultimately, the Museum für Hamburgische Geschichte accepted to store the objects in their premises.